Antigen comes from the root term antibody generator and is an organic substance that initiates the creation of antibodies thereby bringing about a prompt immunity retort. On the other hand, antibodies which are also termed as immunoglobulins comprise of gamma globulin proteins that are contained in the various body fluids and the blood stream in all vertebrates. Antibodies essentially make use of the immune system to recognize and fight foreign elements that can cause harm to the system like viruses or bacteria. Antigens are made of either polysaccharides or proteins. This may contain components like cell walls, capsules, flagella, toxins or fimbrae of viruses, bacteria and other microorganisms. On the other hand antibodies are made of organic structural units including a couple of large heavy chains and a couple of small light chains. Antibodies develop from plasma cells in the blood. The purpose that the antibody serves is that it is produced by the body in order to bind and thereon render all foreign particles into an inactivated state in the body. When the entire process of binding goes unhindered the antibody manages to bind specifically the particular antigen in question. The particle that is formed in the process is called the antigen. Antigens on the other hand precisely serve the purpose of stimulating a state of alertness in the body initiating immediate immune response. So the basic difference between an antigen and an antibody is that the emergence of the former leads to the production of the latter, both functioning in an antagonistic organic process to each other. Antibody is the particular protein purposely produced to counter a specific antigen. 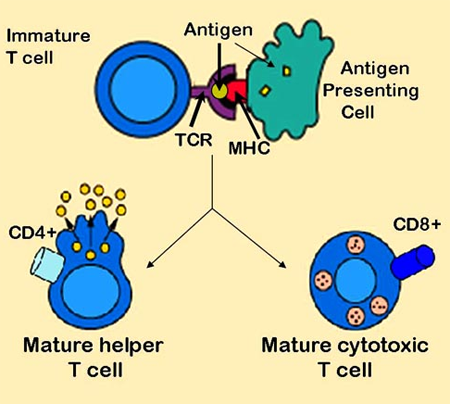 Other than these three there is another distinctive kind of antigen called the T-independent antigen. Antibodies are always Y-shaped with a difference in the higher branch. This is due to the structural difference existing amongst the amino acids in the antibodies that help in exact antigen recognition. On the other hand the antigen has a surface that acts as the binding site for the antibody. Once combined by the y branches of the anti body, the antigen gets destroyed. 1. Antigen is an organic substance that initiates the creation of antibodies, whereas antibodies make use of the immune system to recognize and fight foreign elements. 2. There are five basic kinds of antibodies and three basic kinds of antigens. 3. Antigens are made of either polysaccharides or proteins. Antibodies, on the other hand, are made of organic structural units. Abishek. "Difference Between Antigens and Antibodies." DifferenceBetween.net. April 12, 2018 < http://www.differencebetween.net/science/health/difference-between-antigens-and-antibodies/ >. This is so poorly written, I’m not sure what the heck I just read. Clean this up and have it make sense. Start with the first sentence: Too many ideas trying to punch out of the bag. Talk about one thing at a time and compare it directly to the the next object. Don’t start a sentence with “When”. Read paragraph 3, what happens to particles? Do they turn into antigens if unhindered? Do I need to know a hinderance? “So the . . .” Bad conclusion description after the previous explaination! Gees people. I’m realizing that much of the material on the web is incoherent, self contradictory, and desperately in need of an editor.